July 16-18, 9 a.m. to noon. Basing all activities and music on the “water” themes in the Bible – 1) Jesus Walking on the Water 2) Fishers of Men 3) Jonah and the Big Fish – children will sing, dance, play instruments and learn Bible stories and music. Enrollment is limited to 30 children. Fifteen members of the Celebration Choir and nine church members travelled to the New York City premiere of Dan Forrest’s newest large work, “Jubilate Deo,” on March 20, 2017, in Carnegie Hall. 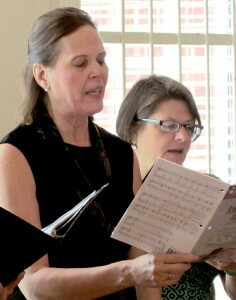 The singers joined 170 other voices from around the United States in a mass choir assembled by Manhattan Concert Productions. As part of the Masterworks Series, the Celebration Choir submitted the recording of last year’s “Requiem for the Living,” also by Dan Forrest, for its audition piece. Henry Leck, director of the Indianapolis Children’s Choir, commissioned this work and he will be the mass choir conductor. The Indianapolis Children’s Choir will also be singing parts of the piece. 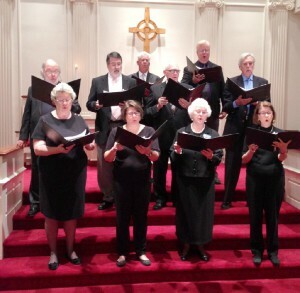 The choir members returned to Fayetteville and performed “Jubilate Deo” in the Sanctuary on April 2nd. To listen to that performance, click here. The inspired “Requiem for the Living” from March 15, 2015, is now an audio recording prepared by Don Perkins. It has been paired with photos from Michael Ruff and the result is now on YouTube. 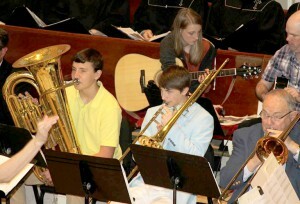 You can find the worship music by searching for Requiem for the Living Dan Forrest First Presbyterian. https://www.youtube.com/watch?v=IK1oPJMVIwM. Dr. Heirman Mervin earned a Doctorate of Musical Arts degree in Organ Performance: Liturgical, Church and Synagogue Music (2008) and a Masters of Music in Church Music: Church Music/Organ (2006) from the University of Michigan. During graduate school she was inducted in Pi Kappa Lambda, national music honors society. Initially following a ministry call with intentions to attend seminary, she earned a BA in Philosophy/Religion and Music at Spring Arbor University. She began studying piano at age 4 and switched to organ with Dr. Roberta Bitgood in Battle Creek, Mi, National AGO President and composer at age 12. She has served churches as principal organist from age 15 in Michigan, Georgia, Oregon, Pennsylvania and The Netherlands. She has three young adult children living in Scotland, Michigan and North Carolina, who are all dual citizens with The Netherlands, and she is fluent in Dutch. She has played many of the great organs in The Netherlands and Germany. To dowload and read a copy of the latest Music Ministry brochure, click here.